This inspection must be done within the preceding 12 calendar months. If you accomplished it on the 2nd of April, it wouldn’t be due until the 30th of April the following year. This inspection must be done by an A&P mechanic with an Inspection Authorization (IA). If your annual inspection is beyond 12 calendar months, you will need a ferry permit to fly it to another airport. If you want to carry passengers for hire other than yourself, get paid for giving flight instruction, you must complete a 100-hour inspection as well as the annual inspection. You can exceed the 100-hour limit by 10 hours, but ONLY if the extra time is used to fly the aircraft to a place where the mechanic will work on it. You can’t fly an extra 8 hours and then fly the last 2 of the 10 hours to a maintenance base. You also lose that extra time you flew to the next inspection. So, if you flew an hour to a maintenance base, you now have 99 hours until the next 100-hour inspection. For a checklist of items covered on a 100-hour inspection check out this easy-to-read pdf: 100/Annual Inspection Checklist. Note: this is just an example and is not kept updated. Go to the CFR Appendix D to Part 43 for the hard-to-read official list. Transponder: you cannot use a transponder unless it has been tested within the preceding 24 calendar months. Emergency Locater Transmitter (ELT): Installed ELTs must be inspected for “proper installation, battery corrosion, operation of the controls/crash sensor, and sufficient signal strength.” Usually it’s covered in the annual inspection because it’s required every 12 calendar months. No matter what kind of aircraft maintenance you need, Norfolk Aviation can help! 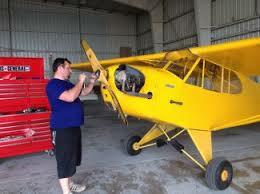 Our licensed aircraft mechanics offer inspections, routine maintenance, repairs, and even PAINTING! We have the knowledge and experience you need to make keep your aircraft safe and sharp. Call us today at 757-724-6047 to find out more about our maintenance and inspection services.